A Salesforce checkbox is a field which can only be checked or unchecked. 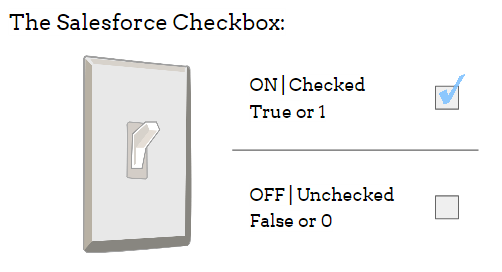 When configuring your Salesforce Submit Connector, it is best to use the send-as values of a "1" or "TRUE" to check the box and a "0" or "FALSE" to leave it unchecked (or to uncheck a box that is already checked). For both the Submit and Prefill Salesforce Connectors, if you are connecting a FormAssembly checkbox field to a Salesforce checkbox field, you will need to individually map each FormAssembly field to a unique checkbox field in Salesforce. You can learn more about checkboxes and individual mapping in our video on Building a Form for Salesforce. Please note that the capitalization of "TRUE" and "FALSE" does not matter in this case. In other words, Salesforce understands "FALSE", "False", and "false" as long as there are no leading or trailing spaces. However, when working with formulas, capitalization is still a necessary consideration. When configuring field mappings for a FormAssembly multiple choice field (i.e. radio buttons, dropdown menus, lists, and checkboxes) you will need to define send-as values in your connector. The send-as values are the pieces of information that the connector will send over to Salesforce. Oftentimes, these send-as values can be record IDs that represent pre-defined values that you have established in Salesforce. You can also learn more about send-as values in our video on Building a Form for Salesforce. When mapping from a multiple choice field in FormAssembly to Salesforce, it is often easiest to use Salesforce's Picklist or Multi-Select Picklist field types. Use Salesforce's Multi-Select Picklists for FormAssembly's checkbox and list questions. Use Salesforce's Picklists for FormAssembly's radio buttons and menu questions. When you are configuring the connector, you can choose to carry alternative values into Salesforce, such as abbreviations or Record IDs. As mentioned above, we call this the Send-As Value. When sending a form's multi-select picklist values to SFDC, they should be separated by semi-colons. Finally, you can learn more about picklists in our video on Building a Form for Salesforce. Note: If the user's choices are coming through comma separated instead of semi-colon separators, you can delete the connector's mapping of the field and remap to resolve this issue. To edit a field mapping that you have already created, simply hover your mouse over the field in the connector and the Edit Mapping button will appear.